For no reason she can figure out, sixteen-year-old Lex Bartleby is one crazy angry girl. Previously normal and a good student, the high school junior can barely get through a day of school without punching someone out. The only reason that she isn’t kicked out of school a week before summer is that her very loving parents devise a plan to turn her around. She has to spend the summer in the country (Adirondacks) with her Uncle Mort, whom she hasn’t seen since she was six. Lex is sick about the idea of being taken away from her twin sister and forced into the boredom of the tiny town of Croak. But Croak isn’t the hell hole Lex thought it would be. Or–rather hell holes are not really so hellish when she gets the insiders’ version. With the help of Uncle Mort, Lex discovers she is perfectly suited to reaping the souls of the dead and helping them move on to the afterlife. And the afterlife can be quite entertaining, not at all what people usually envision. The downside to Lex’s new job is its very long hours; the upside is her partner Driggs, who is clever, insightful, and hot. The push-pull of their relationship is very funny and brings a good deal of humor to the novel, which is more of a mystery than it is a horror book. Finding new friends, Lex may come to enjoy her reaping. But when there is no explanation for deaths of some of the people she and Driggs are sent to collect, things get scary fast, and no one is safe–including the reapers themselves. 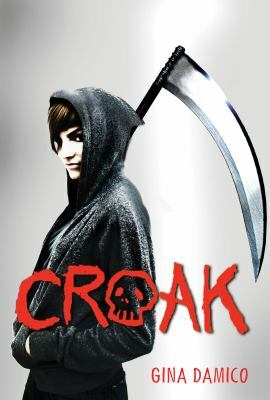 High school housekeeping: For a quick, engaging teen read, Croak is perfect. It has all the best elements of a novel. You may have to finish in one sitting. Mystery and romance are combined with perfect pacing, witty dialogue, and deeper questions about right, wrong and vigilante justice. A great summer read for all teens–don’t miss this one! This entry was posted in Fiction, Horror/Mystery/Suspense, Young Adult Literature and tagged Adirondacks, book reviews, Crtoak, Gina Damico, horror, humor, mystery, small towns in fiction, YA fiction, YA literature. Bookmark the permalink.